What’s really your landing page? After spending quite a bit of effort working on SEO lately, I’ve noticed an unforeseen problem that this optimization has created. With more and more users finding my site through search engine queries for recipes, the entry point into the site has shifted. Normally, we think of the home page as being the first page a user sees when they reach your site. Thus, the home page will capture the user’s attention within seconds, look the prettiest, and really sell the product. It’s the home page that you do A/B testing on and allot most of your initial dev time to. As a content site, a lot of users will find my site through one of the 10,000+ recipe links that I put out there on search engines. 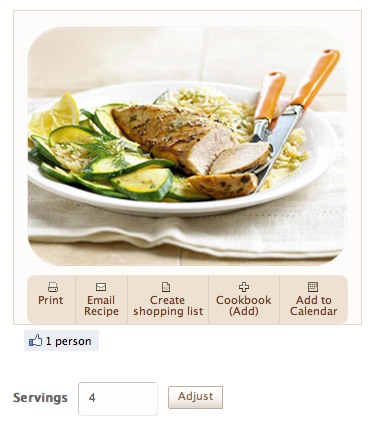 A user may search for “chicken recipes” and come across this little gem. This page, in this case, would be the first impression the user gets of KitchenPC. The problem with this page was it just wasn’t designed to really sell KitchenPC as a product. The user has no idea what my site is, except for a place where recipes live. If you’re a long time reader, you know that these recipe “permalinks” were a feature I added a bit after launch to promote recipes on the site without requiring a user to have to create an account and logon. It also gave Google something to crawl since Google can’t reach the secure pages. The home page, back then, was nothing more than a “please sign up!” message and a quick blurb about what the site does. I never had the money for a clever video or the time to do a site tutorial, so I figured I could attract users through recipe links. This worked relatively well, however the static recipe page design was built to be completely static content without any of the real KitchenPC features. It only displayed the raw recipe data, unlike the site’s “popup” recipe viewer which had all sorts of great functionality like “Create shopping list”, “Adjust serving size”, and “Add To Calendar.” Someone looking at this static recipe page would have no idea that these features existed, and very few users would know they had to logon, go dig up the same recipe using search, and then they could work with the recipe using the meal planner tools. I’m still a bit short of complete parity. For example, you can’t yet rate a recipe on this page (I need to refactor a bunch of the rating code before I can implement this correctly, but hopefully soon.) Creating a shopping list will also overwrite your existing shopping list without warning, rather than prompting you if there’s existing items like the popup version does. This is because I don’t load the user’s shopping list into memory on this page. The page also doesn’t provide the ability to remove the recipe from the cookbook if it’s already there. However, these minor issues will be fixed in due time. The point of this work was to advertise to new visitors what the site can do. Suffice to say, when new users stumble across the site through search engines, Facebook Likes, and Twitter posts, they’ll definitely notice KitchenPC provides a lot more meal planning tools that they wouldn’t otherwise know existed. Hopefully this will result in a few more signups in the coming weeks!